The first time an ink painting by the classic Chinese modernist Qi Baishi appeared at an auction in the Czech Republic was twelve years ago. It sold for the starting price of almost CZK 60,000. One of his hanging scrolls was offered again in October 2009 and was sold for a sensational CZK 2.4 million after having been offered for the starting price of CZK 216,000. Since then, an additional forty paintings by Qi exceeded the one-million-koruna price tag at Czech auctions. All except for one were auctioned by the Arcimboldo Gallery, which has been specialising in Chinese art in recent years. At its December auction, it will offer eleven hanging scrolls by Qi, with the reproduced Lotuses having the potential to surpass the artist’s existing price record, according to the auction house’s owner, Oldřich Hejtmánek. Its large format (twice as large as the largest hanging scrolls yet auctioned), attractive motif (the red lotus is a symbol of happiness in China) and excellent painting technique make this painting an extraordinarily enticing piece of art for Chinese buyers. Last year, a piece with a similar motif but only half as large, Wilting Lotus and Dragonfly, sold for CZK 10.8 million, and Qi’s current record stands at CZK 11.5 million. So it is not unlikely that Lotuses will become this year`s most expensive piece of art sold at a Czech auction. The first position is currently held by Filla’s Man’s Head with a Pipe, auctioned in May by Galerie Kodl for CZK 16.8 million. Qi Baishi (1864–1957) did not come from a literate family, but from a humble rural environment in the province of Hunan in south-east China. Originally he trained as a woodcarver and took up painting when he was twenty-seven. He never trained formally; he was a self-taught artist who used the traditional painting manual The Manual of the Mustard Seed Garden from the end of the 17th century. In his work, he managed to absorb various painting styles, including the then-popular Shanghai School characterised by its distinctive colours. Qi moved to Beijing in 1927 and gradually became renowned. Thanks to the collector Vojtěch Chytil, the Czech environment was introduced to his work already in the years between the two world wars. The collection of Qi’s paintings at the National Gallery in Prague, which consists of around ninety hanging scrolls and the core of which are pieces acquired by Chytil in the 1920s and 1930s, is one of the largest in Europe. Qi was elected a chairman of the National Artists’ Association in the 1950s and an honorary president of the newly established Beijing Academy of Art shortly before his death. 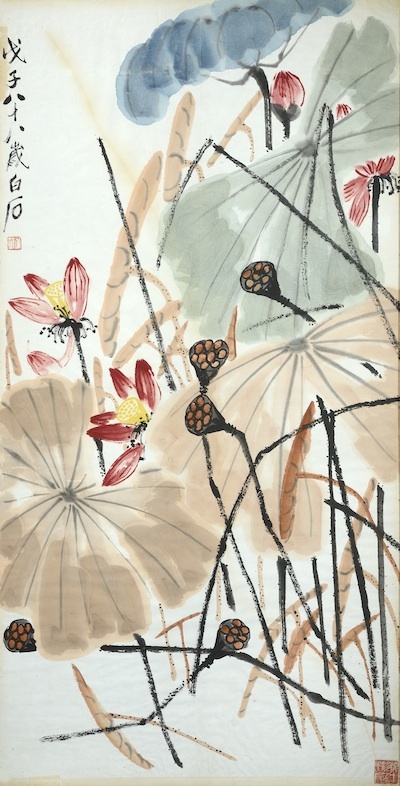 Qi Baishi is a truly national artist in China and his works have recently been fetching record-high prices. Three years ago, his monumental triptych Eagle Standing on a Pine Tree, auctioned off in Beijing for 65 million US dollars, was supposed to have been the most expensive piece of art auctioned off that year anywhere in the world. According to The New York Times, which wrote a large exposé on the Chinese art market last year, however, the painting has never been paid for, as there were doubts about its authenticity. The newspaper cites estimates by experts that Qi painted between ten and fifteen thousand hanging scrolls during his long life. Roughly three thousand of them are in the collections of renowned museums and some of them were destroyed during the Japanese occupation and the Chinese Cultural Revolution. Nevertheless, according to auction records, over eighteen thousand works by Qi have appeared on the Chinese market in the last twenty years, which logically implies that a substantial number them have been counterfeits. It is this infestation of the Chinese market with forgeries that partially explains the interest of Chinese buyers in the Czech Republic. Due to a concurrence of historical circumstances, there was quite an active cultural exchange between the socialist Czechoslovakia and the People’s Republic of China in the 1950s, and a host of pieces of Chinese art from that era ended up in our country. Paintings offered at Czech auctions usually have a documented provenance back to the 1950s, which increases their attractiveness in the eyes of Chinese buyers (who are usually investors more than collectors). Oldřich Hejtmánek is convinced that average pieces are frequently sold for more here than in Hong Kong. For instance, the Lotuses painting mentioned above comes from the estate of Karel Starý, who was military attaché in North Korea between 1953 and 1957. A second work by Qi, which the auction house expects will arouse great interest among the bidders, is the painting Sitting Fisherman from the collection of Miroslav Böhnel, who was a sales representative with the Czechoslovak Embassy in Beijing between 1951 and 1955. The painting’s motif is atypical, as Qi Baishi rarely painted human figures. On the ART+ portal, sinologist Olga Lomová draws attention to one small and inconspicuous hanging scroll, Seven Shrimps, which, according to the calligraphy in the upper part of the painting, can be dated between 1933 and 1934. Shrimps seem to be the most common motif in Qi’s paintings, as four different shrimp paintings are being offered at the December auction organised by the Arcimboldo Gallery. Pieces of art that are twenty years younger are commonly offered at Czech auctions. Even if the expected record is not broken, it is probable that Qi Baishi will become the artist with the highest turnover at Czech auctions this year.